There is a four-part (S.A.T.B.) 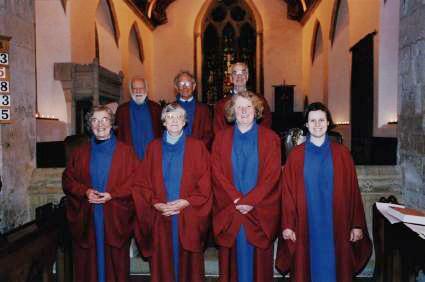 choir at St.John the Baptist Church, Bere Regis, which sings at all main services - Sunday morning and evensong, and major festivals which occasionally fall on week days. The choir leads the singing of hymns, psalms and canticles; and sings anthems at the Sunday morning and evening services - some "a cappella" and some accompanied. There are vacancies in the choir for trebles, sopranos, altos, tenors and basses. New singers of all ages are always welcome and if you would like to apply to sing on a regular basis or for particular services only, please contact the organist or the vicar. Choir practices are held every other Friday evening at 7pm, in the Morton Chapel in the church. The choir have were designed and made by, Liz Teather. They were dedicated on Advent Sunday 2003. For special events the choir is augmented by additional singers who only join the choir for the event , but who do not normally sing in the choir. 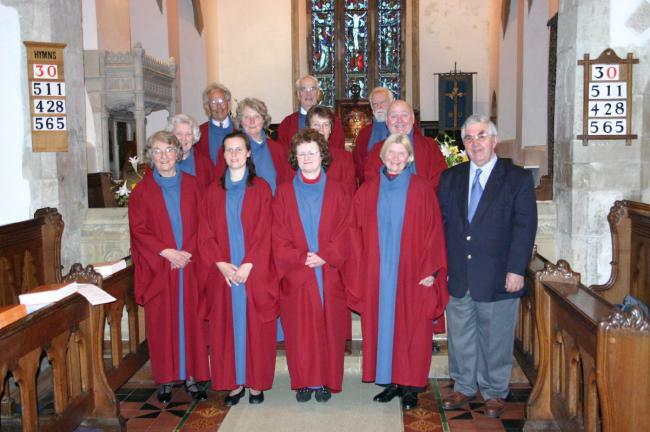 The photograph below shows this choir with John House, one of the two retiring Churchwardens, the other warden John England, is in any case a regular member of the choir. There are vacancies in the St.John's Choir for trebles, sopranos, altos, tenors and basses, on both a regular and an irregular basis. Experienced singers and novices are most welcome. Singing (and general music) tuition is provided (free) for younger choristers. A large number of works are performed throughout the year. During 2003-4 the choir has sung works by Arensky, Attwood, Bach, Bairstow, Beethoven, Brahms, Brewer, Bruckner, Byrd, Croft, Crotch, Elgar, Farrant, Goss, Gounod, Handel, Ireland, Ives, Liszt, Lloyd Webber, Mendelssohn, Mozart, Palestrina, Parry, Pergolesi, Purcell, Schubert, Stainer, Stanford, Sterndale Bennett, Tallis, Tchaikovsky, Tye, Vaughan Williams, Vittoria, Wesley, and many other famous and less well known composers. Rehearsals are held in Bere Regis on Friday evenings. Auditions, which can be arranged at any time, are held in private !